Heat oven to 350°F. Spray large cookie sheet with cooking spray. Place loaves, seam side down on cookie sheet, about 3 inches apart. Using sharp knife, cut 5 diagonal 1/2-inch-deep slashes on top of dough. Bake 26 to 30 minutes or until golden brown. Meanwhile, in medium bowl, combine coleslaw mix, onion, bell pepper, cucumber and cilantro. In 2-cup measuring cup, combine 1/2 cup of the soy-teriyaki blend, 1/2 cup of the rice vinegar, 1 tablespoon of the brown sugar and 1 teaspoon of the chili sauce. Beat well with wire whisk. Pour over vegetable mixture; stir to combine. Set aside, stirring occasionally. In 1-quart saucepan, combine peanut butter, remaining 1/4 cup soy-teriyaki blend, 1/4 cup rice vinegar, 1 tablespoon brown sugar and 1/2 teaspoon chili sauce. Cook over medium heat 4 to 5 minutes, stirring occasionally, until smooth. Set aside. In 12-inch skillet, heat oil over medium-high heat. Add chicken tenders; cook 7 to 10 minutes, turning once, until chicken is no longer pink in center. Add peanut sauce; stir to coat. Remove from heat. Cut each loaf crosswise into thirds. Cut each piece of bread in half lengthwise down center to within 1/2 inch of bottom. 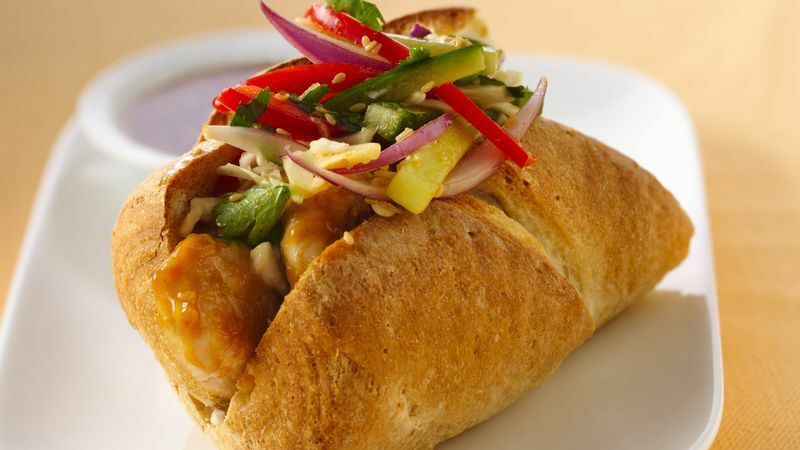 To make each sub, spoon 1/6 of chicken mixture into each piece of bread. With slotted spoon, top each with about 1/2 cup vegetable mixture. Serve any remaining sauce as a dipping sauce.